Bees are social animals. They belong to a hive which might comprise up to 50,000 bees. The hive is a super organism, a super intelligence which performs for the good of the colony, aided by the physical uniformity of the cells in the hive. But humans are not like bees. We thrive and comfortably exist in groups no larger than 150 (Dunbar’s number). Why don’t we create workspaces that are designed for humans (i.e. human centred office design)? Spaces that encourage and allow people to be creative, calm, or energised. And at the same time enable easy communication, collaboration and sharing. Light, fresh air, temperature and humidity all impact heavily on how we perform. These can be moderated to allow for our daily cycles. Colours, textures, sounds and smells can have profound effects on how we experience our lives. Relating to nature has proven to be extremely beneficial to the human organism. Work, designed as play and creativity, in notionally playful environments, is very powerful. Problems become exciting challenges. Conflict becomes idea exchange and co-creation. We can create human-based workspaces, for example, by repurposing, bringing nature indoors and adding colour. This need not cost any more than conventional office design. In fact human centred office design should save money. Planted walls do the job of far more costly air conditioning. Salvaged artifacts showing the heritage of a company are far less expensive than corporate art. Vitally, workplaces should create a sense of belonging, not in the sense of a bee hive, but a personalised human invitation to be an active contributor to a varied community. If people belong they take responsibility. If they take responsibility, they make decisions. If they make decisions…THING GET DONE…THINGS CHANGE…THINGS GET BETTER. Let’s create a better world; we can start simply by creating better, human-friendly workplaces. Martin Knox is a lead designer in the Rype Office team and was a member of the design team for Rype Office’s NHS Cardiff project. He works with organisations to find, define, articulate and deliver their truth. He has 25 years of innovating in design and brand development for companies including Next, Sainsbury’s, Boots, M&S, Schuh, Cancer Research UK, Dixons, Burton, Magnet, Converse and Kangol. Rype Office uses human centred office design, combined with sustainable office furniture, to create attractive, sustainable and budget-friendly workspaces. 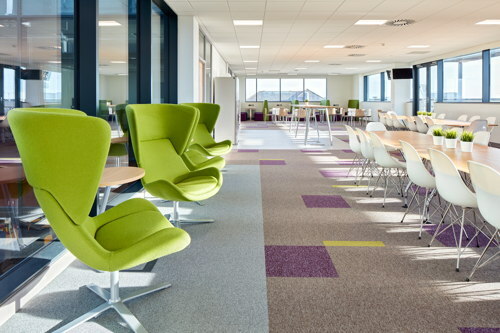 Rype Office’s approach has successfully transformed existing offices and created inspiring new spaces. Visit Projects to see examples.